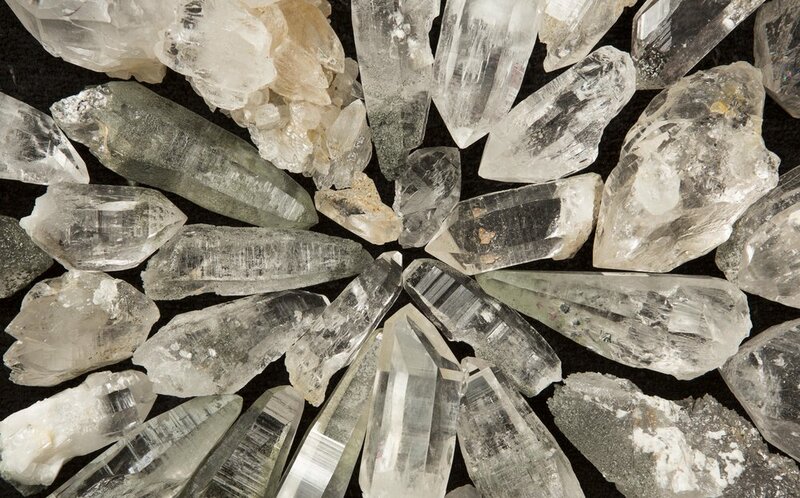 Why are these Himalayan crystals so special? Words by Joseph Carini, photography by Robbie Masterson. Many years ago, while working on my carpets in Nepal, I spotted a beautiful crystal in the window of a small shop. While the owner of the shop was eager to do business, he refused to sell me the crystals that attracted me. He eventually told me that such examples are hard to come across. I looked for others like his but soon found that there were none in the shops. And that is how I entered the dazzling world of top quality, triple A himalayan crystals. It became my quest to find them. And what makes them so special? At first glance it might be their incredible natural forms which mimic the shapes of the mountains they are found in. These crystals come from an area adjacent to Mount Everest on the Tibet-Nepal border. They are super dense and carry the high frequency energies of the pure air they were formed in. Harvested by local inhabitants at an altitude of between 12,000 and 16,000 feet, these literally come from the rooftop of the world. Acknowledged by many healers and shamans as the most powerful crystals in the world, one only has to hold one to know that they are different from any other natural crystal. They feel heavier and have a strange hypnotic quality that cannot be explained but rather experienced. The literally attract the attention of certain people like a magnet. Even now as I write this I find myself gazing at the examples on my desk. H 9.5" x W 6" x D 6"
I have put this collection together over the past 4 years. Many happy hours have been spent in my quest to attain the best pieces. When The Armoury contacted us to host their The Armoury's Fall/Winter 2017 lookbook in our Tribeca showroom, we could not resist. We have long admired their brand, from the attention to detail to the boutique shop itself and were flattered to have been asked to get involved! Check out the results below. The Armoury Fall/Winter 2017 Lookbook was inspired by the idea of the global citizen, recognizing the important impact culture and relationships have on the expression of clothing. The Armoury focuses on connecting individuals from small operations (with many of our artisans handcrafting their goods, honing their skills across decades), with our clients across the world. We honor the space and time it takes to create quality and those standards upon which it is founded. The rich colors of the Joseph Carini designer carpets (made in Nepal), and the handcrafted African furniture pull together the ethos of The Armoury Fall/Winter 2017 collection. Left: Area rug 'Hailey' (8'10" x 11'5") - pink floral flat weave rug from Afghanistan stocked by Joseph Carini. Right: Area rug 'Sophia' (9'8" x 13'1") - light blue flat weave rug from Afghanistan stocked by Joseph Carini. The backdrop is Tree and Cloud 2 (12' x 16') an original design by Joseph Carini. Tree and Cloud 2 is an ode to spring days and classic Eastern motifs. On a bronze background, fragrant cherry blossoms of copper and violet bloom under whimsical floating clouds. Woven in luxurious silk. Backdrop area rug is 'Madeline' (10'1" x 13'9") a flat weave handmade in Afghanistan. 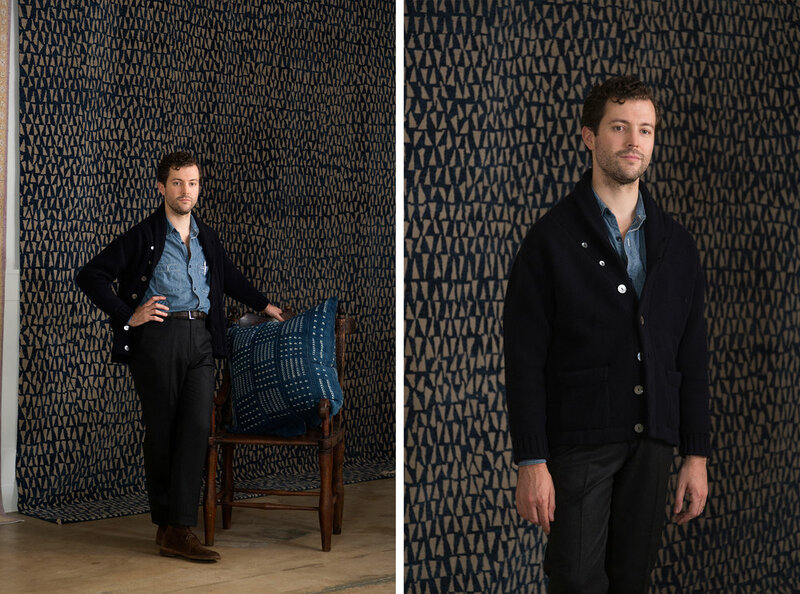 The backdrop is Dancing Triangles (9' x 12') by Joseph Carini Carpets made with indigo. Area rug 'Hailey' (8'10" x 11'5") - pink floral flat weave rug from Afghanistan stocked by Joseph Carini. through our website, on the Shop Now page! Read in depth about our exhibition in collaboration with the Japanese ceramic artist Yuki Hayama. The catalogue includes images and descriptions of all of Hamaya's ceramic works on view in our showroom, as well as detailed images of the carpet designs produced especially for this collaboration. We are also selling these catalogues in our New York showroom, or you can purchase by phone. Joseph Carini Carpets is pleased to present Beauty of Life, a special collection of carpets designed in collaboration with Yuki Hayama. 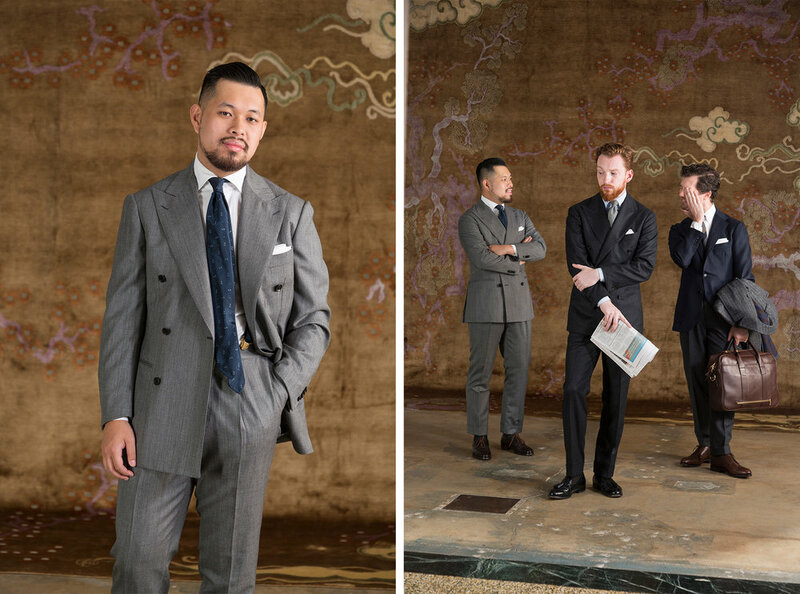 The four unique carpet designs, handwoven by skilled artisans in Nepal, will be displayed alongside the impressive ceramic works of Hayama, calling together two mediums of artistic expression. Two of the four nature themes seen throughout Hayama's pottery, Water and Earth, are brought to life on the larger canvas of Carini's carpets, translated with hand-spun Himalayan wools and the finest sparkling silks. The use of natural botanical dyes in these and almost of all of Carini's carpets further enhances the commonality between the works of these two artists, both of whom strive to bring the natural world into their artistic world, and whose designs are dominated by inspirations from nature. Joseph Carini's Beauty of Life collaboration with Yuki Hayama will be his first with a ceramic artist, and is a perfect pairing of two artists with like minded sensibilities. 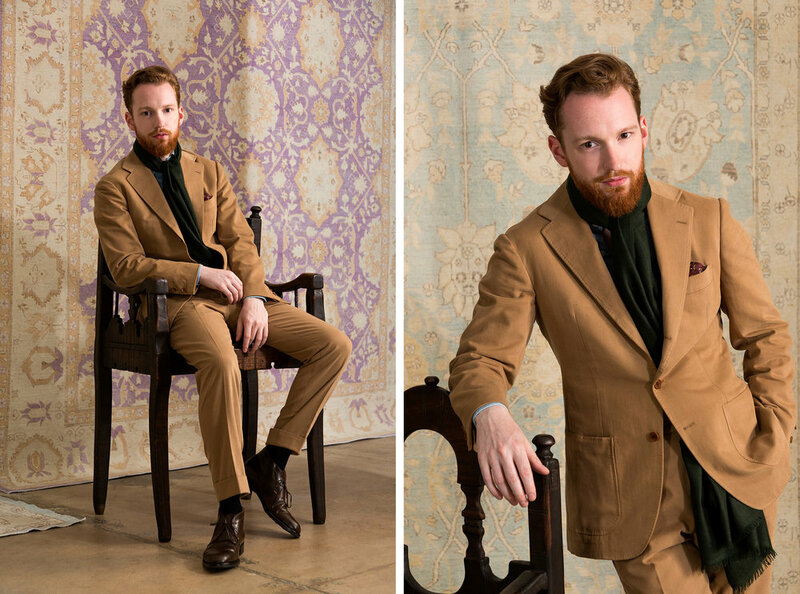 When they first met in NYC last year, Joseph Carini was immediately taken with the artist who, like himself, believes in creating lasting works of handmade art that fuse old world craftsmanship with modern, unique products for today. Carini strives to make carpets that appeal to both the eyes and the heart while valuing authenticity and process. Hayama aims to create a feeling of vitality and harmony in his ceramics with a message of universal love for humanity. The forces of nature are beautifully represented in Yuki Hayama's ceramic work with figures of animals, trees, flowers, water, fish, sky and earth. Similarly, Joseph Carini draws inspiration from nature for most of his carpet designs. In Carini's work you can see imagery of storm clouds, evening skies, sparkling waters, wild animals, blossoming trees, as well as many abstract iterations of those themes. He takes a literal approach in his collaboration with Hayama, with four of Hayama's painting s replicated in woven carpets. Join us on Tuesday, September 20th at 2PM for a Gallery Talk with Michael Chagnon, the Curator of Exhibition Interpretation at Japan Society Gallery, New York. Michael will be discussing the artistic connections between east and west Asia encapsulated in Hayama's ceramics, and the exchange of visual ideas that is one of the Silk Road's most enduring legacies. Read more about Yuki Hayama's work here! Visit our showroom this month to view Beauty of Life! Keith Haring was an artist who emulated the youthful 1980's art scene in New York and made a name for himself with his playful, cartoonish drawings. Within his universe, objects, lines, and colors were transformed into playful, happy, cruel and tragic moments. Haring knew early on that he wanted to develop his artistic abilities and he knew he had to be in New York. Haring arrived in New York in 1978 as a scholarship student at the School of Visual Arts. He was particularly inspired by the Graffiti he experienced in the subways and began to find his own individual style. Haring noticed that throughout the subway platforms there were black spaces where advertisements were supposed to be placed. He immediately knew this was the perfect canvas to get his message across to the masses. Using white chalk he would draw every time he saw an empty panel. Haring achieved international recognition through several group and solo exhibitions. His first Soho solo show was held at the Tony Shafrazi Gallery and was regarded as extremely popular. As Haring's popularity grew so did his anxiety with dealing his own works of art. Soon he took up representation with Tony Shafrazi which freed him to focus on his work. Haring's international success began in 1984 when he traveled around the world painting wall murals in Australia, Brazil, Paris, and Italy. For Haring, art was intended for everyone and public wall murals were a way for him to break down the barriers between the high/ low audiences. Haring's work in the mid-late 1980's showcased the theme of AIDS, mainly because it had a heavy influence in his personal life. After experiencing his friends passing away year after year, Haring himself was diagnosed with AIDS in 1988. The diagnosis didn't come as a surprise to Haring but prompted him to work twice as hard and twice as fast. Throughout his career, Haring devoted his time and energy to several charities, hospitals, and children's day care centers. Before his death he established the Keith Haring Foundation to continue his charitable support of children's and AIDS-related organizations. Haring's work can be seen in exhibitions and collections of major museums around the world. Joseph Carini Carpets has teamed up with Italian designer and architect Alessandro Mendini to present The Earthquake Collection at Fragile this week during Salone Del Mobile. This is the first collaboration for Mendini and Carini, and highlights Joseph Carini Carpet's fine Tibetan weaving techniques with Mendini's brightly colored design aesthetic. These carpets were woven by a small group of women weavers in Nepal who started their own business weaving small traditional carpets. Joseph Carini and a select team of weaving masters have been providing these women with training in lost weaving techniques as an effort to preserve a cultural heritage. These designs were in the process of being woven when the huge earthquake hit Nepal in 2015. While none of the carpets were damaged, the women's homes were damaged beyond repair. Joseph Carini and Alessandro Mendini decided to name this collection, The Earthquake Collection, and the four carpets were named after villages in Nepal affected by the earthquake. Alessandro Mendini has played an important role in the development of modern Italian design, and is well known for his mixing of different cultures and sensibilities to push design boundaries and forego conventional notions of function. Some notable aspects of Mendini's work are smart clean designs, with a colorful playfulness and these keystones are expressed once again in this carpet collection. Upon hearing about the opportunity to collaborate with Mendini, Carini was thrilled at the prospect of working with a design icon whose design philosophy aligns so closely with his own. Joe Carini's love for mixing different graphics and bringing interesting forms of expression into his carpet designs is what keeps him passionate about his work and the art of carpet weaving. These designs are a limited edition collection, and Joseph Carini Carpets will only be making 10 sets of each design. The designs can be custom made in any size and material preferred. The latest trend on the runway is the comeback of retro geometric. The idea of geometry itself may be ancient, but these bright geometric patterns are modern and chic. Geometric patterns add an eye-catching element to a room. From open cubes, to repeating circles, there are several ways to incorporate this trend into your own home. What we love is the the retro twist on this trend, that incorporates the bright pop of color and graphic contrast between shapes and sizes. The best way to incorporate this trend into your space is by starting with the carpet. Choose a pattern that is either a large scale shape or a pattern with a tighter scale. It should go without saying that patterns mixed together may not look the way you pictured. Create a place for your eyes to rest by grounding your graphics with a solid piece. Incorporate a solid couch with a great texture over a graphic carpet. Having fun with color is whole point of this trend, incorporating great bold colors with our classic geometric patterns. Katie Lydon has been designing in her downtown New York interior design firm Katie Lydon Interiors for over a decade. Migrating from London, Lydon felt at home in New York's Tribeca neighborhood. Between designing polished uptown townhouses or a stylish downtown loft, Lydon creates comfortable and beautiful homes. Katie Lydon's work reposes on an elevated design style, a neutral base, pops of color, and artwork as the focus. Lydon attended Wimbledon Art School in London before continuing her education at Cambridge University. Using her knowledge and passion for antiques and architecture, Lydon is able to bring the highest quality to her clients. Lydon always focuses on designing with the client's unique personality and style in mind. Her versatile style allows her to work in a variety of both timeless and contemporary environments. Katie Lydon's interiors effortlessly combine classic and modern styles without crowding the space. And she has amazing taste in art, always bringing a large and powerful piece to her projects. Lydon is a master of mixing furniture pieces with large canvases for a clean sophisticated look. Katie's work has been featured in several design publications. Katie Lydon was named Elle Decor's 5 designers to watch in 2010, and five years later we are still loving what she does! Art Deco design is famously known for it's bold, geometric, and lavish characteristics. The Art Deco style originated from France after World War I and was influenced by the rapid industrial movement sweeping across the world. The name 'Art Deco' comes from the 1925 Paris Exposition Internationale des Arts Décoratifs et Industriels Modernes where the sleek machine-age look came about. As a departure from Art Nouveau, Art Deco elements are sleeker and more stylized. Both art movements emerged as a reaction to major world events; The Industrial Revolution and World War I. Art Deco style tapered off with the start of World War II, as people viewed lavish and over the top designs as inappropriate for war time. Art Deco had a great influence on interior design. Incorporating streamlined geometric forms and metallic color, Deco interiors tend to be bold with ornate elements. Art Deco furniture pieces include components such as curved features, mirrors, clean lines, chrome hardware, and glass. Designers included geometric fabrics and elements that highlighted chevron patterns, sunburst shapes, and zigzags. One of the most important themes for Art Deco is the exotic. Bringing in different patterns from different cultures represented wealth; for example, lacquered walls were a specialty Asian technique, and African inspired patterned pillows brought in wild and unique touches to a room. Some of the finest examples of Art Deco art and architecture are found in Havana, Cuba. The Bacardi building is noted for its particular Art Deco style, designed by architects Rafael Fernandez Ruenes, Estaban Rodriguez Castell, and Jose Menendez. This building, built in 1930, has small ornamental gold-leaf zigzag patterns and bronze bats, the Bacardi logo, throughout the space. Other cities that have great examples of Art Deco architecture include Rio de Janeiro, Miami, and New York City. Incorporating Art Deco into your own design scheme can add a visually interesting element. 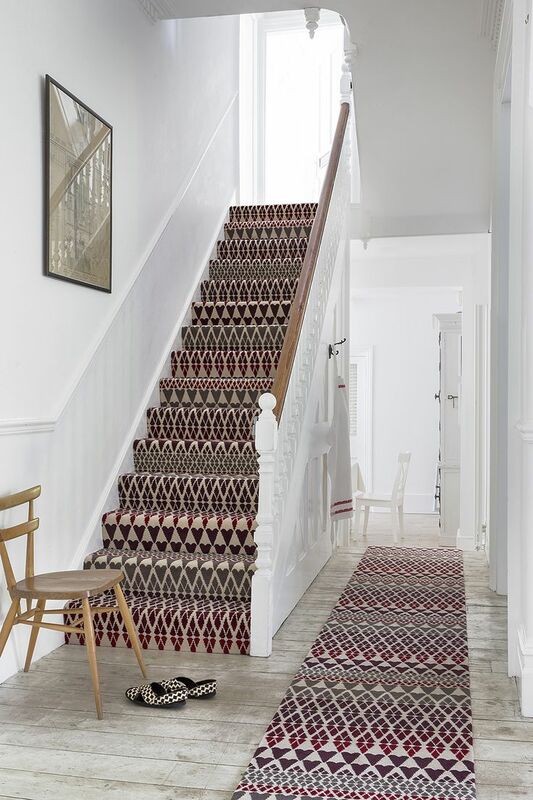 Start off with bold geometric patterns, either in your tiled floor or in a bold silk carpet. Along with strong patterns, incorporating glossy and metallic furnishings brings a luxurious feel into your home. Art Deco also has a minimalist nature, so keep balance with some solid colors and streamlined lighting and furniture in your design. The story of wool began long ago, and has been one of the most widely used and useful materials on the planet. Dating back 10,000 years ago, wool was introduced to Europe from the Near East and has traveled even farther since then. Wool is obtained from different types of sheep and the quality varies based on the breed of sheep and their environment. Here at Joseph Carini Carpets we use Himalayan highland wool, which is especially excellent for carpets. Wool processed in the Himalayas is stronger, more insulating and has a natural resistance to soil and dirt. The high altitude of the Himalayas produces a soft texture and makes for perfect material for rug weaving. Along with sheep, other types of wool are extracted from different breeds of goats, such as mohair and cashmere. The processing of wool is categorized into shearing and scouring. Sheep shearing is when the woolen fleece is cut off and separated into four categories: fleece, broken, bellies, and locks. Wool straight from the sheep has a high level of lanolin (a natural grease), and has to be scoured in order to remove some grease from the wool. The quality of wool is determined by its fiber diameter, crimp, yield, color, and staple strength. Overall the fiber diameter is the most important wool characteristic. Wool serves as a natural insulator and the fibers absorb and release water vapor making wool carpets perfect for every season. Wool's insulating factors help to reduce energy costs and keep your home warm. It also happens to be an extraordinary renewable textile fiber - as long as there is grass for sheep to graze on, every year fleece will continue to be produced! At Joseph Carini Carpets we love working with wool because it is a safe material for homes and is beautiful AND durable. Wool is extremely easy to clean and maintains it's appearance for many years. Wool is truly a wonderful material in all of its forms and is the perfect material for you're next carpet! Currently the Whitney Museum of American Art is hosting a retrospective of Frank Stella, who is hands down one of the most important living American artists. The exhibition tracks the New York artist's fifty-seven-year career. In 1959 Stella gained early recognition with his series of impersonal black striped paintings that were prominently displayed in 1959 at the Museum of Modern Art's exhibition, "Sixteen Americans." It was a fresh introduction to minimalism and a farewell to Abstract Expressionism. His Black Paintings, is composed of black inverted parallel U-shapes containing striped separated by thin lines of unpainted canvas. It's flat 2D geometric pattern reiterates the minimalist's practice of simplicity and stark impersonal themes. The retrospective mostly runs chronologically, with a few newer paintings placed next to his earlier work for comparison. Some of his most famous work was done during his Protractor series, which contrasts his Black Paintings series and depicts bright vivid colors and curvy shapes. His piece Harran II also uses a 2D geometric pattern that reminds the viewer that it is just paint on a canvas. The work is architectural and its shape was based on the protractor drafting tool. This piece itself is massive and makes quite an impression in person. Stella contined to use the shaped canvas technique that incorporates geometric forms and color variation through the 1970's. From flat painted canvases, Stella moved to painted aluminum reliefs, and then onto sculpture. The exhibition gradually shows this change and concludes with a few sculptures on the outside balcony. 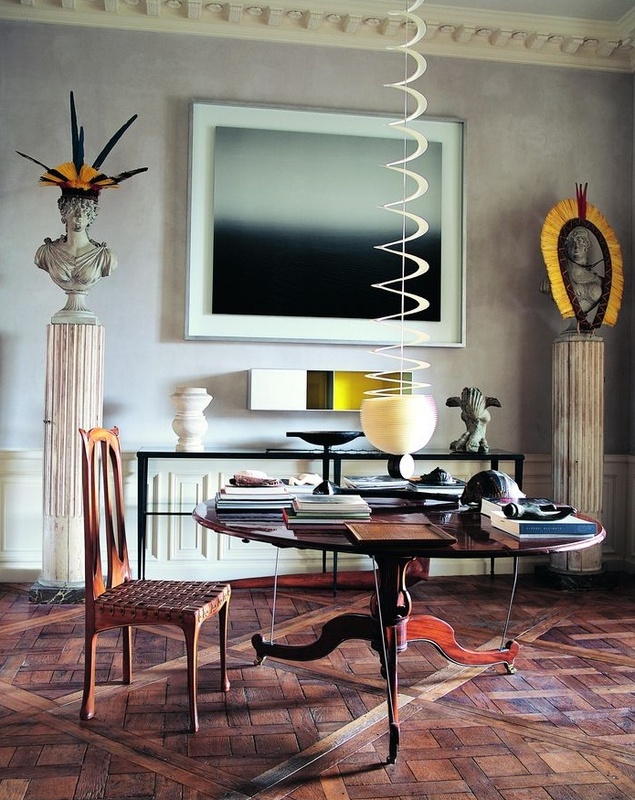 Frank Stella, 79, divides his time between his townhouse in Greenwich Village and his studio in the Hudson Valley. The exhibition is closing February 7, 2016 and is so far the largest exhibition for the Museum's new space in the Chelsea neighborhood of Manhattan. Pantone has just announced their Colors of the Year for 2016 - Rose Quartz & Serenity. A unique pairing of two pastel hues, this is a first for Pantone to choose two colors. Pantone stated that these two colors are the answer for a stress filled life that is yearning for peace and calm. These two colors joined together demonstrate an inherent balance between a warmer rose tone and a cooler tranquil blue. Pairing these two colors will bring a vast amount of design and fashion inspiration for the new year. One of the main reasons Pantone introduced these two colors together is to address the traditional perception of color association in our society. 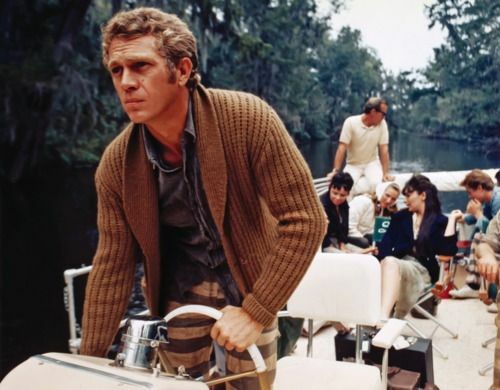 The new generation seemingly has less concerns about being typecast and instead keeps an open mind and approach to using color. Pantone wants their clients to feel more comfortable with using color to express their emotions. Instead of seeing baby nursery colors, Pantone hope people will see an alternative to the always popular beige. It's about time we see these colors as more than a gender identifier. This color duo isn't a stranger to being paired up together - it's a natural pairing. Pink has become something of a neutral over the years, and we may see baby blue turn in the same direction. Both colors blend seamlessly in everyday life. Pantone reaches out to bring calm to the storm, and reminds us that there is light at the end of the tunnel. In the interior design community we've seen pastels used frequently in the past. In fact pink has almost become a neutral, and paired with other colors can create a range of moods. Shown above is our Storm Cloud 10x14 carpet on the right, a perfect pairing that brings out a range of blues. Shown on the left is an antique distressed Persian rug that combines both the Pantone colors perfectly! For these two colors it's about using them together to combine their calming effects. Not just for baby's room anymore, you'll be surprised at the sophisticated result from a serene blue silk carpet with dusty pink paint on the walls. Check out more of Carini Lang's carpet options below! Many of our customers associate nettle with hemp or jute, and although they're similar, nettle has certain characteristics that set it apart. Hemp and nettle are both food, fiber, and medicinal plants used throughout the world. Nettle is an English name used for the type of plants that have stinging hairs. Himalayan nettle, the type of nettle that we use here at Carini Lang for our carpets, grows wild in fertile forest soils in altitudes ranging from 3900 to 9800 feet in the Himalayas. The fiber is extracted from the stem of the plant and is stripped until the fiber is extracted. We choose to weave nettle here at Carini Lang because it is a beautiful material that offers durability, texture, color variation and creates a spectacular silky luster. The whole plant is filled with beneficial elements - the root, stem, leaves, and the flowers. In ancient Greek times, the stinging nettle was used mainly as a diuretic and laxative. In ancient Egypt, reports are found of nettle infusion for the relief of arthritis and lumbago pains. Today the plant is still used for these common ailments and several other illnesses including diabetes, and as blood purifiers. Drinking nettle tea is a common way of ingesting it's various medicinal benefits. Nettle was also used for everyday practical purposes such as durable rope and fishing nets for Europeans and Native Americans. Nettle fibers have been woven for centuries, and were the popular choice for clothing before the production of cotton. The fibers of the stinging nettle plant are hollow which means they can accumulate air inside creating a natural insulation. Nettle is a soft, light weight fiber which is what creates its silky luster. These qualities make them perfect for carpets, and bring a different texture and look to your interior. With our nettle carpets we dye the yarn in batches which gives the carpet a great color variation and abrash. Here at Carini Lang we process our nettle without any pesticides or chemical dying and we prefer to dye our carpets with vegetable dye. The beautiful color variation of natural un-dyed nettle is even so appealing that we often use no dye at all and let the mix of unaltered nettle color variations shine through on their own! We all have those rooms or entryways that remain empty due to lack of inspiration - not to mention, a great runner can be hard to find! A runner can warm cold feet, absorb sound, and be the perfect finishing touch to a smaller room or hallway. We're big fans of interesting runners here at Carini Lang and we believe that in long narrow spaces or under certain furniture pieces they can add visual interest and another layer of design. When it comes to choosing a color for a runner, think about how you would like to compliment your interior and also keep in mind what colors and materials will hold up over time in a high traffic area . If you're choosing a piece for a hallway or small space that won't be in between the outdoors and your home then you can play with more delicate materials or lighter colors and pattern. We recommend choosing a low pile rug for an entry way. It will last longer and stay in great shape. If you have a long narrow entryway, then choosing a runner can make your space feel warm and can even make it feel wider. Adding a round rug can add an elegant touch and create the feeling of a grand entrance. An entryway rug, or hallway runner is a welcoming way to show your personal style as soon as your visitors walk in! The Bauhaus design school is approaching 100 years since its founding and still to this day we're decorating our homes with the famous Wassily chair, designed by Marcel Breuer and famously named after his good friend Wassily Kandinsky. This chair was the first to use tubular steel for decorative purposes. The Bauhaus school and style is still relevant to design today, not just because of its history, but because of its philosophy that the marriage of form and function is still the back bone of taste and sophistication. The Bauhaus was an art school founded by Walter Gropius in 1919. Gropius's goal was to 'create a new guild of craftsmen, without the class distinctions which raise an arrogant barrier between craftsman and artist.' The school's roots lay in the arts and crafts, but also combined modernism, and constructivism. In the end the reigning principles taught at the Bauhaus school were that design is in the service of the community, and the perfection and efficiency in geometry. Throughout this learning period Gropius grew weary that the school would be confined to its ideas instead of producing goods for their market. He wanted the goods produced to be accessible for all people. The school had multiple locations throughout the years, including Dessau, an industrial town near Berlin in 1925. During this time students turned masters included Josef Albers, Marcel Breuer, Herbert Bayer, and Marianne Brandt. Although they had brought in teachers such as Wassily Kandinsky and Paul Klee to promote production, it was from this point on that the Bauhaus started to decline, beginning with Gropius's resignation in 1928. 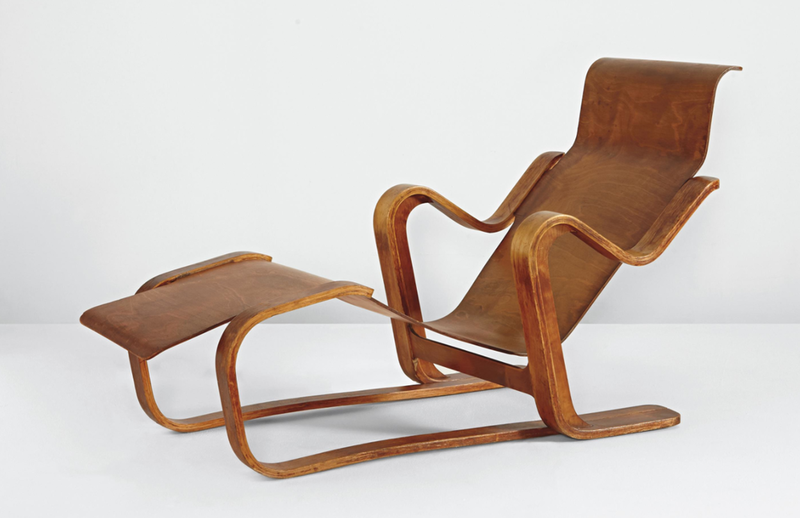 At the time that Ludwig Mies van der Rohe was appointed as director, he had already designed the German pavilion at the 1929 Barcelona Exposition and his famous Barcelona chair. Although he began his directorship obeying the government's needs, things quickly spiraled as Hitler became more and more powerful. Many Bauhaus artists were exiled to America, and others were killed by the Nazis. Luckily, in America, Bauhaus artists were able to successfully showcase their designs. Marcel Breuer followed his mentor, Gropius, to Cambridge where he joined the faculty of Harvard's Graduate School of Design. In 1941 Breuer left Massachusetts and moved to New York City where he maintained his practice permanently. From there on he has designed institutions, houses, and commercial buildings all over the world. He went on to design buildings such as The Whitney Museum in New York City in 1966, the IBM research center in La Gaude France, and The Hooper House II in Baltimore in 1959. During this period where Bauhaus artists were successfully disseminating their ideas, it was Florence Knoll who began to see the potential and asked who would design the interiors to these modern buildings? She decided to license Bauhaus and other furniture designs for mass production. To this day Knoll is still one of the only distributors of genuine Bauhaus furniture. What we consider the classic modern look began with the Bauhaus school, and it spans into every art medium; architecture, interior design, graphic design, textiles, and fashion. One of the school's main philosophies was that the relationship between teacher and student was a collaborative one, and in the end it was about reaching a common goal. For this reason, the Bauhaus school was successful and impactful - they looked at a world they thought could be better and worked to improve it in their way. They broke down the elements, simplified them, and then built them back up.